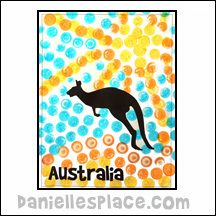 Australia-themed Crafts for preschool and elementary children. Celebrate Australia Day with these teacher resources for homeschools and preschools. 1. Print out the patterns onto colored paper or what paper depending on what technique you want to use and the age of your students. 2. The images above where made by dipping the handle ends of a paint brush into acrylic paint and then dotting it onto the paper. Provide larger and smaller brushes for larger and smaller dots. 3. If you have younger children, you may want to use large markers for less mess. Print the patterns out onto white paper instead of using colored paper so the markers will show up well. 4. 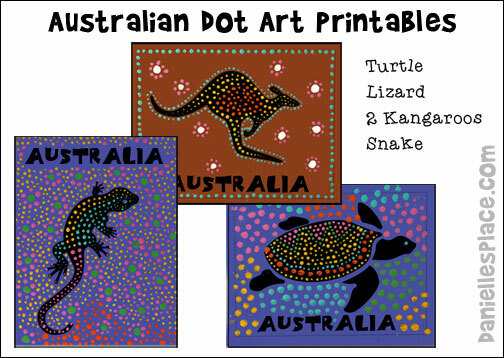 Preschool children will enjoy decorating the images with dotters which make much larger dots. This craft can be done several ways. 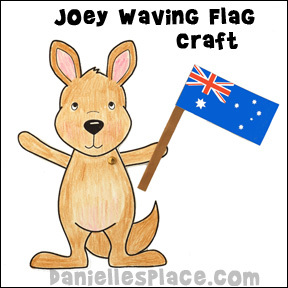 You can cut out the pattern and make a moveable Joey, or use it as a color sheet and glue on the flag. 1. Print out the Kangaroo Joey Pattern. 2. Color the Kangaroo Joey and then cut it out. 3. Punch a hole in the arm and another in the body of the kangaroo where the arm should be attached. Attach the arm to the body with a brass brad. 4. Print out the flag patterns and cut them out. 5. Make a flag pole from brown construction paper. Glue the flag to the pole. Glue the flag pole to the Joey's hand. 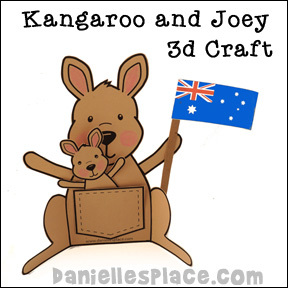 Children will love playing with their kangaroo mommy and joey on Australia Day! 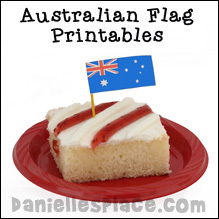 Use this craft for your homeschool unit studies on Australia Day or Australia homeschool unit study. 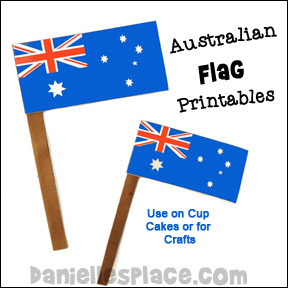 Available in three different sizes: (3 3/4" x 2"), (3" x 1 1/2"), (2 1/2" x 1") Use these flags for your Australia Day craft projects, for decorations, or to decorate cup cakes. 2. Cut out the patterns and fold them in half. 3. To make the flag poles cut pieces of construction paper 3" x 3/4" wide. Draw two lines 1/4" apart down the length of the papers. Fold on the lines and glue the folded paper together. 4. Glue the poles onto the paper flags and glue the flags closed.